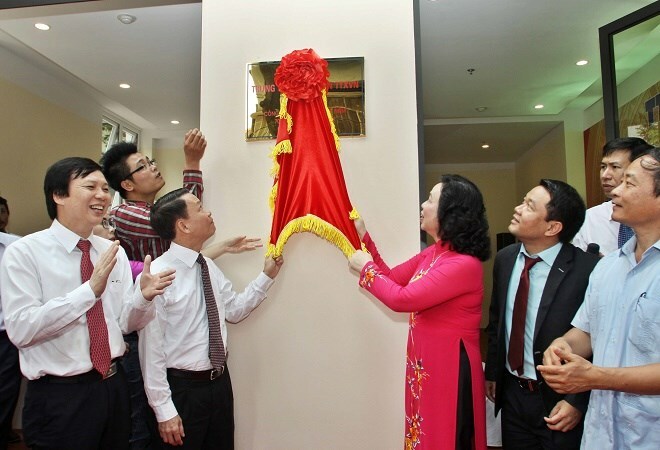 The Vietnam News Agency (VNA) inaugurated and put into use its information centre in Hanoi on August 11 as part of activities celebrating its 70 th founding anniversary (September 15). Headquartered at No. 21 Pham Dinh Ho Street, the six-storey building will provide a variety of mainstream source news on electronic, paper, television and audio platforms that vividly reflect every aspect of life in Hanoi. In his opening remarks, VNA General Director Nguyen Duc Loi requested the Hanoi bureau do its best to run the centre effectively. Ho Quang Loi, Head of the Hanoi Party Committee's Department of Popularisation and Training, said the opening of the centre is intended to supplement a network of VNA bureaus at home and abroad, adding that tens of thousands of VNA articles, photos and television programmes have been provided for the domestic and foreign media to spread Hanoi’s image around the world. He also praised the VNA and its Hanoi bureau in particular for their strong sense of responsibility and professionalism. The VNA has grown in stature as a national news agency and one of the leading media groups in the country, he stated, expressing his hope that the new centre would be professional with up-to-date, unbiased and accurate coverage of Hanoi developments.